Lumeris offers a definitive formula for value-based health plan operations in shared-risk or global-payment models. Strategic investments in business transformation consulting, structure and implementation, value-based care services, and collaborative payer operations offer health plans and at-risk health systems opportunities to dramatically improve efficiencies and effectiveness. Return on this investment is evident through an organization’s ability to meet the goals of the Triple Aim Plus One: better health outcomes, lower costs and improved patient plus physician satisfaction. 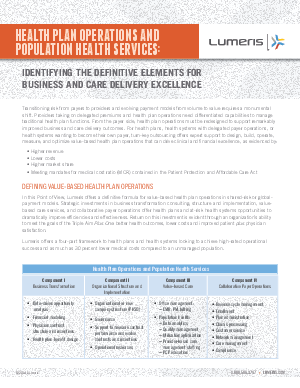 Lumeris offers a four-part framework to health plans and health systems looking to achieve high-rated operational success and as much as 30 percent lower medical costs compared to an unmanaged population.